Ray fourth-grader (please see comments) Phillip Parker-Turner won another tournament this weekend: Glenn Panner's Orland Park Scholastic. . . . Who is Mark Jutovsky, you ask? A guy who hasn't played a rated tournament in ten years, that's who. Mark's decade of inactivity, however, didn't stop him from winning Saturday's Evanston Chess Economy Open with a perfect 4.0/4 against a tough field. . . . In other news, the chess world has a new champion today. He’s Vishy Anand of India, and he’s been one of the top players in the world for many years. Now he’s the best. Vishy won a tough tournament in Mexico City against six other players, including the previous champ, Vladimir Kramnik. Next week’s Miami Open promises to be one of the biggest national chess tournaments of the year, and besides Shabalov, Nakamura, and the other usual suspects, Chicago’s very own FM Aleksandar Stamnov and Expert Ron Washington will be there as well. They’re our guys, so let’s all root for them. Internet access permitting, we may even get some reports from them at the scene. Are any other Illinois players going to the tournament? Glenn Panner has a blog. This is good news for chess in the Chicago area, so now that he’s online, everybody please go there, leave comments, and give Glenn encouragement to blog often. Glenn has a great deal to offer the chess conversation in this area. He’s an Expert (rating > 2000), a National Tournament Director, and he’s been active in chess in the South Suburbs and all across the state for decades. He also sponsors many chess events and organizations. Glenn is not the only local chess blogger, thank goodness. If you want a global perspective on chess, Sevan Muradian provides one at the North American Chess Association, reporting on news from all over the world. . . . Vince Hart continues to blog about his chess adventures, though to his credit he is not seized with the need to feed the bloggish maw incessantly or even every month, for that matter. He just posts when he has something to say. What a concept! . . . Chess mom Cheryl doesn’t write only about chess, but since her son Trevor Magness is a strong player (he recently reached Expert status at the Illinois Open), chess is a frequent theme at her blog A Round Unvarnish’d Tale. For all of this information I owe a big tip of my hat to Chessdad64, from whom I know about Glenn, Vince, Cheryl and so many other people on the chess scene. For years he has published the Midwest’s leading chess blog, the 64 Square Jungle, though it’s been quiet of late while he explores other channels of expression, even as he remains active in local chess. Likewise, Lamarr Wilson’s excellent but short-lived Chess4Chicago.com is alas no more. There are changes afoot at IM Angelo Young’s Touch Move Chess Center. For those of you looking to improve your game, the newly re-crowned state champion is now giving chess lectures on Tuesdays and Wednesdays. Thursday nights the focus is on opening themes. It’s the Sicilian tomorrow night if you see this in time and the Queen’s Gambit next week. Last but not least, Friday nights they play Fischer Random Chess, also known as Chess 960 for the number of possible starting positions. 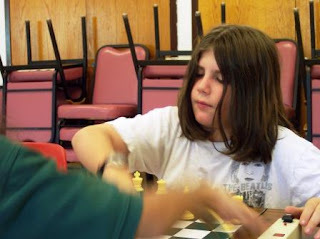 The game was invented by Bobby Fischer, and while the former world champ may be meshugenah, he’s still pretty smart, and some years ago he developed a chess variant in which the pieces in the back rank are scrambled, an innovation that forces players to be creative and renders memorization of opening sequences moot. Go here for more information on Fischer Random Chess. For details about what’s going on at Touch Move go to the Web site or the ICA calendar. This video is pretty funny in light of what goes on today in chess. Hat tip: Streatham and Brixton. Great news. 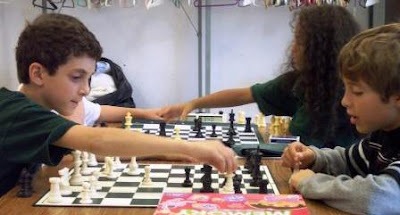 Zack Fishman's Chess Education Partners (CEP), one of the leading organizers of scholastic chess events Chicago, plans to hold several tournaments right here in our neighborhood, at the Hyde Park Neighborhood Club. HPNC executive director Peter Cassel confirmed the schedule. The first tournament will be on Sunday, September 30. The new series is a natural outgrowth of a rapidly developing relationship between CEP and the Neighborhood Club. International Master Jan van de Mortel of CEP offered a chess class at the club last winter and spring, and the organization staged a tournament there last June in which Ray kids won big. The new tournaments, which will be widely publicized and will draw players from all over the city, will be harder for one school to dominate, which means they'll be more fun. They will probably be rated tournaments for which U.S. Chess Federation membership will be required, and there will be an entry fee of $20. More information as it becomes available. For now, please mark you calendar for September 30. Other tournaments are tentatively scheduled for November 4, December 2, January 6, February3, March 2, April 6, and May 4. Good turnout in the early tournaments will insure that the later ones take place, so please plan to attend some of these events. This is a great opportunity for all junior chess players in Hyde Park. Yesterday I drove past the Hayden Market on 53rd Street between Greenwood and Ellis. That’s the convenience store that has let out its east room as a chess club for local blitz players in recent years. Apparently, not anymore. It’s now the Lundy Market, under new management, and from the look of things the chess club is gone. The store was closed when I stopped by and peeked in the window, but there was no sign of chess sets or tables anywhere. So the Hyde Park chess diaspora continues, and once again the neighborhood’s itinerant players must find a new home. Where have they gone? There hasn’t been much of a chess scene at the Starbucks at 53rd and Harper this summer, though I have seen people playing there a couple of times. I went by Harold Washington Park at 53rd and Hyde Park Boulevard and was happy to see that both of the chess tables there were being used, and by chess players, not picnickers. It was encouraging, because chess players have been slow to make that spot a regular venue since the tables went up a few years ago. Then there’s the second-floor café at Borders on 53rd and Lake Park, where some members of the Ray School Chess Club, such as Phillip Parker-Turner and Sonam Ford, like to play. There always seems to be a lively chess scene there whenever I stop in, and the store’s management has apparently relaxed its earlier rule that chess players could only gather on weekdays. I’ve seen two and three games going at a time on Saturdays and Sundays, and I commend the store’s proprietors for the welcome they have given to chess. Finally, there are those two chess tables in Nichols Park near the 54th Street cul-du-sac that were hauled away from Harper Court and dumped in the park a few years ago when chess was banned from the shopping center. I can see them from my living room window; no one ever plays there. Pity. Anyone have any other intelligence about the local chess scene, indoors or outdoors? Any ideas for livening things up? If so, please leave a comment. For the second time this summer The Chicago Reader has published a substantial article on the local chess scene. First it was Ted Cox’s excellent piece on the North Avenue Chess Pavilion, and now, in this week’s issue, Gus Garcia-Roberts trains his spotlight on Cecil Locke, proprietor of the portable “Touch & Go” chess tables on Michigan Avenue. You may have seen Mr. Locke and his rickety tables at the corner of Monroe and Michigan, though not lately because, as the article reports, the City Council “clamped down” on street performers in that area last winter. Mr. Locke and his chess tables have been exiled to the southeast corner of Michigan and Jackson, where they can be found today. Fortunately, he says, business is good in the new location. “Good old fashioned street chess,” Len called it. “The game is flawed, gritty, like Chicago itself.” The game was originally published in the Illinois Chess Bulletin. To get the newsletter, with many other annotated games by local masters as well as chess news from Chicago and around the state, join the Illinois Chess Association. Five-time Illinois State Chess Champion Angelo Young is now the six-time Illinois Chess Champion, following a victory this weekend in the annual Illinois Open, held in Lombard. IM Young was ahead from the beginning of the meet and never looked back, finishing with an outstanding 5.5/6.0 against a tough field. The runner up was NM Christopher Nienart with 5.0/6.0. Other high points were excellent performances by ten-year-old Brian Luo, who finished 10th with a 4.0/6.0, and 92-year-old Erik Karklins, who took the 17th spot in the final standings (in a field of 57), with a 3.5/6.0. (Hat tip: Bill Brock.) Mr. Karklins's rating rose to 2027 after the match, pretty remarkable for a gentleman born in 1915. The final standings are here, and the official cross table is already up, due, no doubt, to the efficiency of Tournament Director Tim Just. Congratulations, Angelo. Addendum (09/05/07): There’s more. Though you can’t tell their ages from the cross table, an uncommon number of the players in this year’s Illinois Open were juniors—high school kids and younger— some of them as young as seven. They all went up against much more experienced adult players and more than held their own. I've learned, for example, that Christopher Nienart, the National Master who finished second, turns seventeen this year. Other juniors who deserve a round of applause for playing in a high-level open tournament like this include Alex Bian, Jason Chien, Josh Dubin, Trevor Magness, Gavin McClanahan, Dan McNally, Ilan Meerovich, Eric Rosen, and Sam Schmakel. More here at the Illinois Chess Association forum. A “blog carnival” is an online event in which posts on a common topic from different blogs are brought together in one place for the convenience and delectation of readers. It’s pretty common in the blogosphere, but not in chess—until now. 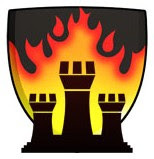 Enterprising blogger Jack Le Moine has just put together the first chess blog carnival. See it here. In other news, IM Angelo Young, the defending Illinois state chess champion, beat FM Aleksandar Stamnov in round three of this year’s Illinois Open, and with a score of 3.0/3.0 is now tied for first place with FM Andrew Karklins. The tournament is taking place all weekend at the Fairfield Inn & Suites in Lombard. Get the latest developments from Tim Just’s Chess for Life.